Knight Hron of Načeradec founded a castle in mid-13th century to protect a tract of an old trade road from Prague to Breslau (Wroclaw), and the town below probably at the same time. The first record of its name is dated in 1254. An earlier settlement was located in the area known as Staré Město (Old Place), with 13th-century St. John the Baptist’s Church. The town was fortified with walls and bastions early in the 14th century. Owners of the castle included kings John the Blind and George of Poděbrady. Over time the castle grew into a large fortress. Powerful and rich Smiřický family acquired the domain in 1544, and had the castle rebuilt into a comfortable Renaissance château; the town also flourished at the time, and was endowed with privileges almost equal to royal charters. The town bought a manor at nearby Slané in the County of Kladsko (Kłodzko) in 1601, which remained its property till 1945. The Thirty Years' War put an end to the prosperity of the town. The properties of the Smiřickýs, who had been loyal to King Frederick of the Palatinate, were seized by the imperial treasury after the Battle of the White Mountain and sold to the Trčkas of Lípa in 1623. When Adam Erdman Trčka was assassinated (together with Wallenstein) in Cheb in 1634, the domain was seized again and donated by the Emperor to his general Ottavio Piccolomini, later Duke of Amalfi. Thus the town fell into the hands of an Italian family, suffered from military operations and forced re-catholicization, but also enjoyed some development: the château was grandly rebuilt in the Baroque style, the first street in the town was paved in 1638, a new town hall was built and St. Lawrence’s Church on the square renovated after the fire of 1663. The burgesses were also granted some privileges. The Piccolominis extinct in 1783, the herrschaft of Náchod, also including the manors of Ratibořice and Chvalkovice, was inherited by the Desfours family and sold in 1792 to Duke Peter von Biron of Courland and Sagan, successful administrator of his property and lover of art and music. Náchod was the second place in Bohemia after Prague where Mozart’s Don Giovanni was staged in 1797. When the duke died in 1800, his eldest daughter Katharina Wilhelmine (1781–1839) inherited Náchod and the Duchy of Sagan. She also kept a palace in Vienna and had close contacts with many political figures of the time (chancellor Metternich, general Prince Windischgrätz, British ambassador Lord Charles Stewart, tsar Alexander I, etc.). Her palace was one of the favourite venues of the Congress of Vienna. 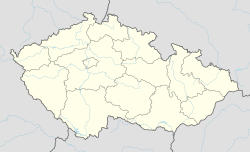 After the death of the Duchess of Sagan, the princes of Schaumburg-Lippe (in today’s Lower Saxony) bought Náchod and held the castle till 1945, though the herrschaft system was abolished in the reform of 1849 and succeeded by public administration districts. Beside the district administration and district court, the reform brought about an elected town council, fast development of businesses and schools, and a building boom that included the neo-renaissance town hall and art-nouveau theatre. Middle-class national awareness and cultural level were on the increase. Náchod was connected to the railway network in 1875. Home weaving and other crafts quickly evolved into full-fledged industries. Town brewery started operation in 1872, and, beginning in 1882, cotton mills emerged one by one at a fast pace, making Náchod one of important centres of cotton and linen spinning, weaving, bleaching, and dyeing mills. Later industrial development includes a foundry, a rubber factory, and an electrical engineering plant. Extensive border fortifications were built in and around Náchod in the years prior to World War II to protect the territory of Czechoslovakia against the threat of German invasion. The border in the area of Náchod did not shift after the Munich Agreement, as no German speakers lived next to the border; on the contrary, eleven villages on the Silesian side of the border were populated by Czech speakers, who lived there till 1945 when eastern parts of Germany were ceded to Poland and former German citizens were expelled, ethnic Czechs included. As Náchod had virtually no ethnic German population, it did not suffer from the massive deportations of 1945–46. It became a somewhat peripheral town during the Communist era (1948–89) as cross-border contacts in the Soviet-dominated bloc were not encouraged. The situation changed in the 1990s and especially when both Czech Republic and Poland became part of the Schengen area in 2007. The 1990s saw a rapid decay of local cotton industry, while some new manufacturing businesses were established. The opening of the border gave a new boost to the traditional tourist industry in the attractive hilly country, as outdoor activities now extend across to the Polish Góry Stolowe National Park. Nachod square and castle ca. 1740. Nachod church and castle during the 1866 war. In 1721 a storm damaged the main castle tower and this was an opportunity to initiate another renovation. In 1751 A granary was built in 1751 and a French garden was arranged over the moat. A theatre was built in the Baroque fortifications in the 1790s, when drama and music functions were staged there four times a week. The castle served as military hospital.during the brief Austro-Prussian War in 1866. It hosts a museum today. Its exhibits include interesting collections from Prince Ottavio Piccolomini's time (e.g. tapestries). Other sights include Gothic cellars and the observation tower (keep). The last surviving cotton-weaving mill (Bartoň); electric motor manufacturers (ATAS, Ametek), rubber factory (Rubena); brewery (Primátor), known for a range of special brews; printing and food-processing industry; road transport company (CDS Náchod); tourism. Hotel and theatre "U Beránka"
^ "Město Náchod - sights". www.mestonachod.cz. Retrieved 2009-03-02.